Baby formula milk is a controversial subject: while nobody disagrees that breast is best, it’s a fact that some women can’t breastfeed for perfectly valid reasons - and it’s a fact that some of those women are made to feel like monsters as a result. That’s a scandal, because baby formula is a perfectly sensible thing to give your child provided you follow the basic safety precautions and keep everything sterilised. Eventually you’ll stop worrying that your formula-fed baby is going to grow horns or be like something from The Omen. We’re going to do this guide slightly differently: normally we recommend specific products, but here we’re going to talk about categories instead. That’s because in the UK baby formula is heavily regulated to ensure that it’s safe, and brand choice really just comes down to whatever one baby likes best. There’s one exception, though, and that’s growing-up formula for toddlers: it only seems to exist because baby formula milk can’t be advertised on TV, which is the legacy of some irresponsible and in some cases outright false marketing claims by household names. Toddlers don’t need formula at all, but the manufacturers need a product they can use to advertise their brand on the box - and unlike baby formula, there’s no ban on advertising toddler milk. And since we're on the topic of feeding time, check out our top picks for the best baby high chair 2018 . Suitable from birth, first infant formula is made from cow’s milk and contains whey protein, which is believed to be easier on infants’ digestive systems than the casein protein found in formula for older babies. Unless you’re told otherwise by a medical professional - that is, not a parenting blogger or someone on mumsnet - this is the best milk for your infant. The best way to get this formula is in powdered form, which works out much cheaper per feed than ready made formula cartons. It’s a bit of faff - you need to make the formula fresh with very hot water each time - but you soon get into the rhythm of it. And it’s always worth ensuring you have an extra tin spare: in recent years there have been shortages of powdered formula due to health scares in other countries. People would buy safe UK formula in huge quantities and send it to their relatives, leaving the shelves empty. We’re into controversial territory here, because the number of babies who actually have lactose intolerance - that is, an intolerance to the sugars in milk and other dairy products - is considerably smaller than the number of parents who think their babies are lactose intolerant after a quick Google or browse of parenting forums. However, once you’ve spoken to your midwife, GP or health visitor you may be recommended the use of a lactose-free formula. Like first infant formula they’re widely available and the powdered form offers the best value for money, but again you need to make sure you keep everything sterile and make the water the right temperature to kill any bacteria. A small number of babies are allergic to cow’s milk, which is what most formula powders and milks are made from. If your baby is one of them then your GP may prescribe what’s known as hypo-allergenic formula, which is formula in which the proteins have been fully broken down (hydrolysed) to prevent an allergic response. That’s not quite the same thing as the comfort formula you’ll see in the supermarket: that’s partially hydrolysed, which means it may be easier to digest but it still isn’t suitable for a baby who is allergic to cow’s milk. Hypo-allergenic formula is suitable for babies from birth onwards, but it should be used under medical supervision to ensure that it’s the right formula for your child. 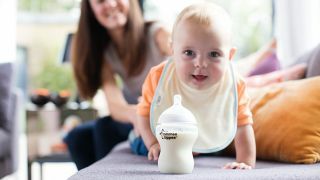 We’ve mentioned ready made formula milk a few times in this piece and noted that they cost more than powder, but there’s one big benefit to them: travelling. The cartons are sterile until opened and can be stored in the fridge overnight, and they’re as handy for a trip to the park as a trip to Portugal. But - and there’s a big but - they’re twice the 100ml limit for liquids that are allowed to go through airport security, so you’ll need to buy them airside. Boots generally has the big brands of ready-made milk in its airport shops but it’s never a bad idea to phone in advance to make sure, especially if you’re travelling from a relatively small airport. Reflux is a horrible thing: it’s when the contents of your baby’s stomach come right back up again after feeding, causing a great deal of discomfort and a lot of crying. Most babies suffer from a bit of it while their muscles develop, but if it’s causing both you and baby a lot of distress then your doctor or health visitor may suggest anti-reflux formula. This is much the same as ordinary formula but it contains a thickener that may help the milk stay down. If that isn’t successful your GP may prescribe anti-reflux medication such as renitadine or omeprazole. Try not to worry, though: most babies have some reflux, and they do grow out of it.